Those of us happy to lead a quiet, perhaps even sedentary, life could be in for a jolt, as gym-going fitness freaks are about to get an even larger stick with which to beat us when a new Japanese system for networking healthcare equipment makes an appearance. 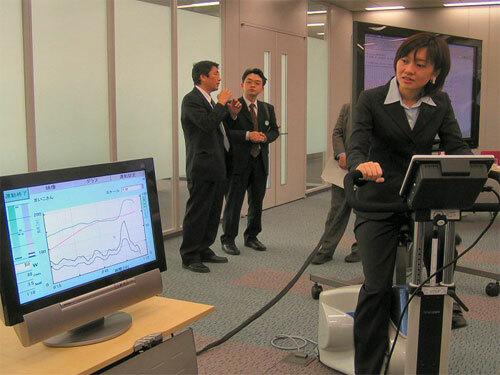 The aim of the project run by Mitsubishi, Citizen, Sharp, Hitachi and Tanita is to establish a standard that allows heart monitors, exercise bikes, treadmills and the like to share data with each other, either through cables or wirelessly. The consequent accumulation of information will be used to keep track of an individual’s wellbeing every time he or she uses any piece of equipment. So far, the ‘Development of High-performance Health Evaluation Equipment for Home Healthcare’ system has successfully passed field trials in which machines used Bluetooth links to correlate information about users’ blood pressure, heart rate, body composition and more to give a comprehensive picture of their health and progress in training. The next step is to prime the healthcare hardware market for the arrival of the new information-gathering facilities, which is likely to start next year. The Japanese national health service is due to be revised next spring to cope with both an aging population and new ways to manage healthcare. Update: Seems I need to clarify  as the name suggests, this is mainly about home gym and healthcare gear. Given the big names involved, if they are successful in that field the technology will clearly spread to commercial gyms and the like, as there’s nothing similar here in Japan that I’ve ever seen.